Some things just happen. It seems an obvious point, but it is one that eludes many in F1 as far as I can tell. In recent weeks and months as Fernando Alonso established his lead at the top of the driver's table, many within and without the sport surmised that Alonso had yet to have his dose of bad luck for this year (though, as my brother pointed out, having to drive a F2012 is a bit unlucky...). Christian Horner, Helmut Marko and Jenson Button, among others, all commented to that effect. Well, following his being erased from the Belgian Grand Prix by an errant Romain Grosjean at the first corner this can no longer be suggested. But the apparent prevailing 'wisdom' in F1 that fortune is something that is doled out roughly equitably over the course of a season is of course a nonsense: there is no reason to think this has to be so. It's not impossible to experience ill luck in every round of a year, or indeed in none. Even in an extended 20-race season there exists no necessity that the law of averages must make itself felt within that time. It indeed amazes me that in a business where evidence, science and empiricism is all, that there still is some reliance on beliefs that have no more basis than astrology or tarot reading. It may be a sobering thought to Alonso and Lewis Hamilton that they could just as easily be wiped out by an opponent at the first corner at Monza too, through no fault of their own. That it happened in the last round doesn't make it any less likely to happen again. Perhaps some in F1 prefer to delude themselves that such random chance can be controlled for, rather than accept that some things just happen, and they can't control it. But whether they like it or not, one thing that they can count on is that dumb luck will have a say in who claims championship honours this year. Grosjean - right decision, wrong reasons? To a large extent Spa's first corner multi-car pile up, triggered by Romain Grosjean, framed last Sunday's Belgian Grand Prix, as well as the post-race discussions. This in part is because Grosjean's been rewarded with a race ban, the first such sanction to be served in F1 since 1994 (unless you include Jacques Villeneuve's de facto race ban in Suzuka 1997). 'why me and why now'? In itself it's quite hard to argue with the penalty: Grosjean veered across the width of the track, under no pressure that I could see, seemingly for no other reason than a crude attempt to intimidate Lewis Hamilton into slamming on the anchors. And he gave Hamilton nowhere to go. And as has been pointed out Spa made it seven out of 12 rounds that he's been involved in an early-race scrape. But some of the reasons for the ban given by the stewards disturb. Most pertinently they saw fit to note in their summing up that the crash 'eliminated leading championship contenders from the race'. Surely this is irrelevant, any sort of natural justice dictates that all drivers should be equal before the law. And if it didn't influence the stewards then why on earth mention it? 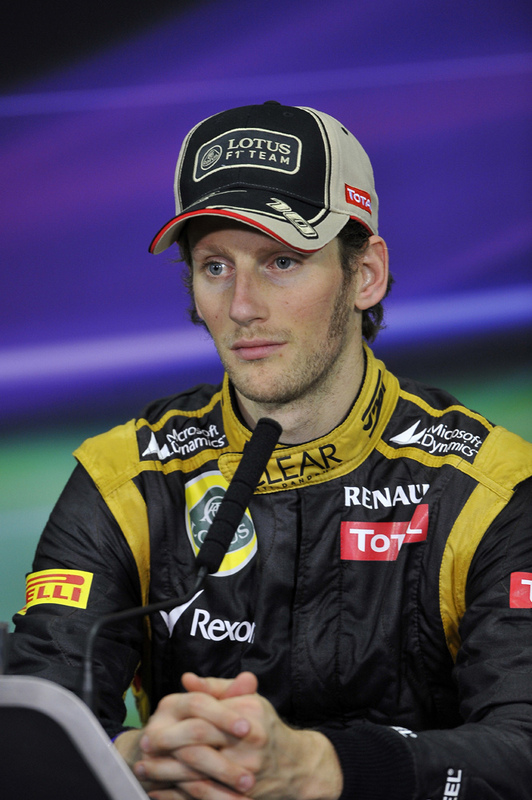 And while Grosjean has accepted the ban he may also be entitled to ask 'why me and why now?' The stewards made no mention of his previous incidents in justifying his ban, and in any case he didn't have any sort of suspended sentence hanging over him (perhaps if this was an influence the FIA should be more transparent about it in future). And while his 'chop' was bad we can think of plenty of recent similar acts that have gone totally unpunished, for example Nico Rosberg in Bahrain this year and Sebastian Vettel in Suzuka last (and they're far from the only ones). Did the stewards in this case react to the violence of the final outcome rather than the nature of the actual offence? If so, it seems to rather miss the point. The outcome isn't the most reliable measure of the standard of the driving, in other words. In an age of increasing risk-aversion and excessive policing of on-track battles in F1, wherein almost any contact between cars - even in what look to be racing incidents - invariably has blame apportioned and sanction handed down in response, it has astonished me that crude blocks and chops - far more dangerous and unnecessary in my view - have been tolerated for so long. Let's hope that instead of my above cynicism this is just the start of such moves being clamped down on with strict penalties. If so, it will stop such ugly and potentially lethal driving in no time. Another part of the fallout of the La Source crash is that it's added further momentum to the efforts to install greater driver protection around an F1 car's cockpit. There was plenty of momentum anyway, as the issue's been pretty hot ever since Felipe Massa's head injuries sustained from flying debris in Hungary in 2009 as well as Henry Surtees's tragic death in a similar incident in an F2 race days earlier. Indeed, the FIA Institute has been investigating solutions, which have included covering the cockpit totally with a canopy or else adding some kind of roll structure in front of the cockpit, for upwards of a year. And last Sunday it was easy to see why this is being pursued, in this modern age of supreme safety it is the accidents wherein things go close to the driver's exposed head, as was the case with Grosjean's car getting oh-so-close to Alonso's cockpit on Sunday, that never fail to make us wince. And following the Spa race McLaren's Paddy Lowe noted that he believes it is 'inevitable' that some form of the in-development cockpit protection will appear on F1 cars, perhaps as early as 2014. But I can't help but wonder if by solving one problem the FIA runs the risk of creating a load more. To take the cockpit canopy idea, will it make driver evacuation after an accident, or in a fire or when fuel or something else unpleasant gets into the cockpit, more difficult? If the car rolls will these become even more troublesome? And what if the driver needs medical attention urgently, will the presence of a canopy add seconds, which could be vital, before medical intervention can commence? And with the roll structure idea, setting aside that they are likely to be grossly unsightly, they could add to dangers by impeding the drivers' vision, and again what happens in the event of a car rolling? Is there a chance that the structure would collapse into the cockpit and thus injure the driver that way? Until these questions are answered I won't be giving my support to roll structures or to closed cockpits. One more thing about the first corner accident at Spa, then I promise I'll shut up about it. 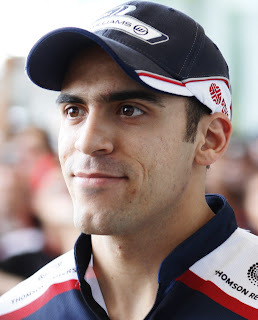 Once again trouble followed Pastor Maldonado in Belgium, in that he managed to cram two transgressions into just a few metres of green flag racing: jumping the start by what seemed an age, then driving into Timo Glock almost as soon as the green flag fell following the post-crash safety car. But one rather curious idea burgeoned after the Spa race (as far as I can tell it was started by Eddie Jordan on the BBC forum, and it grew from there): that Pastor was in some way culpable for the first corner pile up. This is absurd. Pastor was several metres clear of Grosjean and Hamilton when contact was made, indeed there were no fewer than four cars between Pastor and the pair. The 'rationale' (for want of a better word) for blaming Maldonado as far as I can tell focuses on two areas. One is, that his jump start 'distracted' the other drivers. Well, if any driver is sufficiently distracted by a jumped star to swerve across the width of the track into another car then they shouldn't be in F1 frankly. And the other concept is that Maldonado's jumped start influenced where the cars subsequently were in the run down to the first corner. True, but also so far down the causal chain that we're getting close to the realms of the chaos theory/butterfly effect (i.e. a butterfly flaps its wings and the subsequent causal chain triggers an earthquake millions of miles away some time later). You may as well blame what Romain Grosjean had for breakfast for the accident. 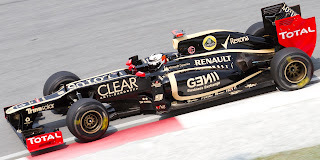 Yes, only a churl would deny that Pastor Maldonado's conduct generally is getting increasingly difficult to defend, or that his errors, clashes with other cars and subsequent penalties are way too frequent. But you can't blame him for everything. Finally, something other than that crash, as promised. Kimi Raikkonen's name was mentioned frequently in dispatches as a potential winner of the Belgian Grand Prix in advance of the weekend. This was for many reasons, a major one though was the advantage we expected to be conferred from the Lotus 'double DRS' device (which, it now transpires, probably has nothing to do with the DRS). expect from the 'double DRS'? The device first saw the light of day as long ago as Friday practice at the German Grand Prix in July, and Lotus team principal Eric Boullier for one reckoned that once it was race worthy the Lotus would be in a position to challenge for the win 'every time'. Some talked of a half a second per lap advantage from it. However, three races, one five-week summer break and approaching two months later we have yet to see it used in qualifying or by extension the race; the reason given in Belgium was that the Friday rain washout meant that they couldn't calibrate the new device prior to qualifying. And it now transpires we'll have to wait longer still to see it, with it apparently being unsuitable for both Monza and Singapore, so the very earliest it could be raced is in the Japanese Grand Prix in October. You'd be forgiven for beginning to doubt whether we'll live to see its race debut. I was also intrigued by Martin Whitmarsh's comments that McLaren hasn't pursued a 'double DRS' device of its own as the team feels the resources required are better used elsewhere on the car. If nothing else, you'd assume if it had the sort of advantages that have been speculated that Lotus would have said something to the effect of 'sod it!' and raced it by now (and that Whitmarsh would have afforded it higher priority). Whisper it: but do you ever suspect that this double DRS device isn't quite all it's cracked up to be? Motorsport by it,s very nature is dangerous. 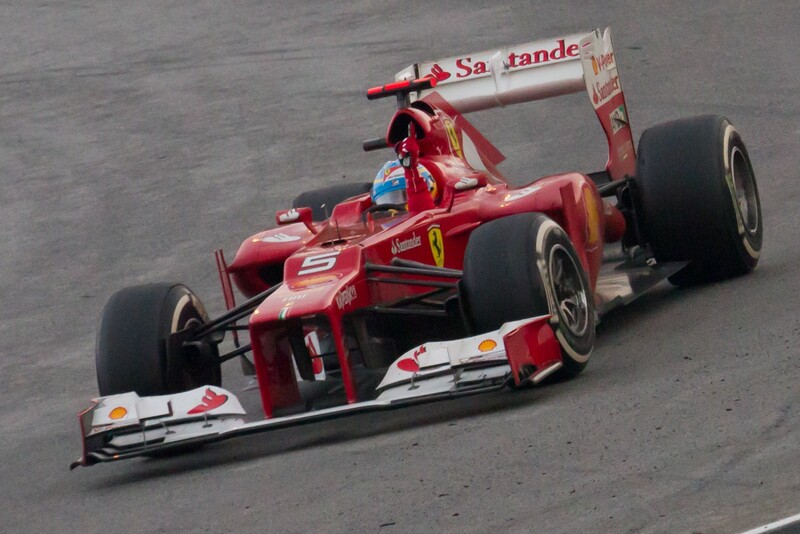 Lets minimize the dangers,but fundementally F1 is open wheel racing & a closed cockpit,mentioned whenever their seems to be an incident,produces heaps of it,s own problems & does not seem a viable solution.